In addition to our traditional doll stand design, the original Butler doll stands, Kaiser has developed a specialty line of display devices. Kaiser Manufacturing features the "Doll Cradle," designed to support baby dolls in a sleeping or reclined position. 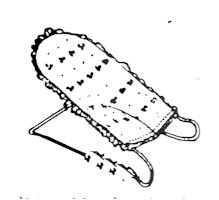 The Doll Cradle is constructed with a cushion coated wire and a washable white embroidered cover with an eyelet ruffle. The straddle stand is designed especially for antique dolls. It will securely support a doll with a heavy china head on a leather or cloth body, where most of the doll's weight is above the shoulders. Kaiser Manufacturing is ready to expand and enhance its product line to accommodate the needs of our customers.